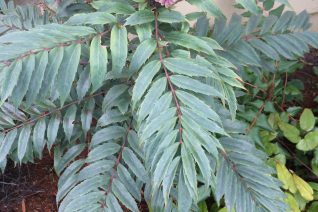 This form of this wonderful Mahonia has leaves that are more silver and a little bit larger than the more commonly seen and finer textured selections of this species. It has also exhibited excellent cold resistance. To 5′ tall moderately fast the finely divided leaves shine. In spring clusters of fragrant yellow flowers are followed by dusty purple/blue berries. Full sun to part shade in average to enriched, well drained sites. Very easy to grow and gorgeous, long lived shrub that consorts with perennials or adds a light texture massed with bolder evergreens. Light consistent summer water speeds growth but established plants are more than drought adapted. Excellent in containers and wonderful winter appearance. Great deer resistance. Forms multiple stems in time to a width almost as tall as it is. These are seedlings from a particularly gray and cold hardy specimen. Easy. Oregon Grape, our ubiquitous state flower. This evergreen shrub can be found almost anywhere aside from the immediate coast to high Cascades west of the mountains. Its native from B.C. to Southern California. Variable shrub to on average 5′ tall and suckering as wide. In rich, happy conditions it will soar to 8′ or more and in more impoverished conditions it makes its life as a spreading low plant. In late February-April the top of the plant erupts in golden yellow incredibly fragrant flowers that are one of the first joys of spring. By late summer this flowers have transformed into clusters of dusty blue incredibly sour fruits. Often employed in the toughest situations where its performance is some what rough. It thrives in cultivation with light, consistent summer moisture. Tolerates heavy clay soils and summer drought. 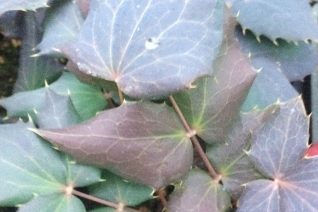 The pinnate leaves often take on purple/maroon tints in winter. Ours are cuttings native to our wholesale nursery site. So its a local plant. Full sun to part shade to quite a bit of shade at the expense of blooming and a lankier outline. Excellent deer resistance when established. Oregon native plant. 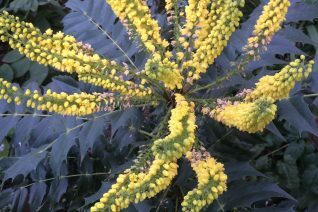 Cascades Mahonia is found throughout the western part of Oregon occupying shady environs under the tree canopy. Low growing creeping evergreen with large deep green leaves. They emerge in spring tinted bright salmon before settling to their mature color. In spring spikes of fragrant light yellow flowers appear and then turn into small edible blue berries. To just 2′ tall but a single plant can spread to 5′ wide in 6 years. Part shade to shade in rich, hummusy soil with regular summer water. Established plants get by with nothing. Takes some patience to establish and a lot of water. Moderately deer resistant. Oregon native plant. 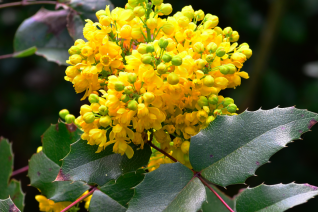 Classic fall and winter blooming evergreen shrubs that are gaining in popularity in the PNW. 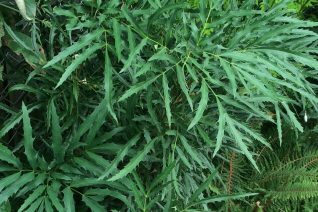 Large growing with stems lined in whorls of intricate divided 2′ long leaves. New growth emerges bright red before settling to blue green. In November – February luminous yellow flower spikes are also very fragrant and beckon to over wintering Anna’s hummingbirds. To 8′ tall and 6′ wide producing multiple trunks in time. Part shade and rich, well drained moisture retentive soil. Though very tolerant of dry conditions when established. Big cool winter blooming shrub. High deer resistance. While visiting Dan several years ago he lamented that Monrovia had not picked up his collection of this showy evergreen shrub. He then gave it to us and we named it after him. 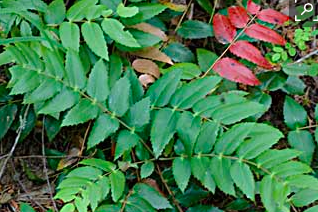 Handsome evergreen shrub with finely serrated divided leaves that emerge ruby red when new. Forms a multiple stemmed patch to 5′ wide and 4′ tall. If it gets leggy do not hesitate to chop it back it will return more dense and less floppy. And it will recover fast. In September 2″ long streamers of light yellow flowers are followed by blue fruit. Part shade to full sun in a protected location with light summer water. Locate out of subfreezing wind. Great in a woodland. High deer resistance.